Upper Rubber Boot is still doing the free giveaway of 140 And Counting over at Goodreads. I’ll be randomly selecting up to around 50 people from the entrants and sending them a free copy. To enter, you’ll need a Goodreads account (which is free), and then just follow the instructions at the giveaway page. 140 And Counting contributor Stella Pierides took part in the Spring Poetry Rain event on the 26th of May in the divided city of Nicosia, Cyprus, where two of her haiku dropped from the sky as rain; her flash ‘The Silence in my Cell’ appeared in Tuck Magazine on the 1st of May; one of her tanka appeared in Take Five: Best Contemporary Tanka Anthology; and one of her haiku appeared in the 4th of May Asahi Haikuist Network, ‘From the Notebook’ section, along with Helen Buckingham. Finally, the Locus Online Roundtable is doing a series of posts on including, most recently, Marge Simon‘s “Speculative Poetry” (URB editor Joanne Merriam also got a call-out in F.J. Bergmann’s “The Invisible Prominence of SF Poetry“). 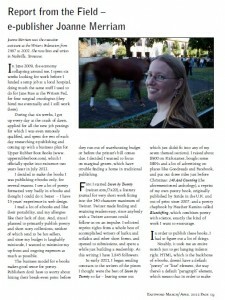 Report from the field, flashfiction.net and some 140 And Counting contributor news. Editor Joanne Merriam was interviewed by Cathy Colborn for flashfiction.net—it went up on Monday. As well, her “Report from the Field,” originally published in the March/April 2012 Eastword, the print newsletter of the Writers’ Federation of Nova Scotia, is now available on their website in PDF (go to page 19). 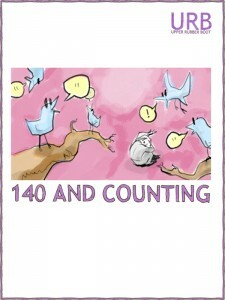 In other news, Upper Rubber Boot is doing a free giveaway of 140 And Counting over at Goodreads! I’ll be randomly selecting up to around 50 people from the entrants and sending them a free copy. To enter, you’ll need a Goodreads account (which is free), and then just follow the instructions at the giveaway page. Berit Ellingsen‘s “Crane Legs” is one of the stories in FlashFlood. Chen-ou Liu had a tanka at Every Day Poets on Sunday. David Kopaska-Merkel has been interviewed by Shelly Bryant, and his poem “Not the Home World” appeared recently at Strange Horizons. Jim Kacian has haiku in see haiku here. And finally, announced today: Cee Martinez‘s “Little Wooden Hands” won the 1st Annual Stella Link #FlashFiction Contest at The League of Extraordinary Authors! Neal Whitman‘s poetry—including a number of haiku—was featured yesterday at The Sound Of Poetry Review: An International Poetry Site for Contemporary Poets. Contemporary Literary Review India published three ekphrastic poems by Neil Ellman last Sunday. Everyday Genius published Berit Ellingsen‘s story “Poison Ore Heart” last Monday. The Tennessee Women’s Theater Project‘s sixth annual Women’s Work features 140 And Counting contributor Gwendolyn Joyce Mintz‘s The Story of my Life (So Far?) at the Looby Theatre in Nashville on May 17th at 7:30 pm. Miriam Sagan‘s poetry has been given wings by artist Christy Hengst — their show Wendover Landing opens at 516 Gallery, 516 Central Ave SW, Albuquerque the Saturday of Memorial Day weekend. See a preview at Miriam’s Well. Neil Ellman‘s poetry appeared with an interview in The South Townsville micro poetry journal on May 1st. Chen-ou Liu‘s haiku appeared on May 2nd in Issa’s Untidy Hut: the poetry blog for Lilliput Review. And one we missed when it came out: Ken Liu‘s touching short story “Memories of My Mother,” from the March 19th Daily Science Fiction.